Series forms part of the Grace (Williams) Forsythe fonds and consists of the minute book of the West Jeddore School trustees from 1944 to 1959, scripts of pageants that may have been performed in schools, and a periodical entitled The Canadian Red Cross Junior, Vol. XXIII, No. 10 dated 1944, which reflects Grace Forsythe’s involvement with the Red Cross Society and her efforts to establish Junior Red Cross Societies in her schools. Series also contains three books created by Grace’s students including a scrapbook of clippings of famous people created by a grade seven class in 1953, a book of stories and drawings entitled Our Story Book created by students in 1961, and a book of stories of rescue created by grade six students in 1962. 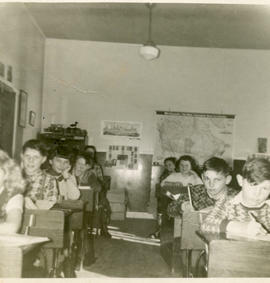 Also included is a book of lesson plans written by Grace in summer school in Truro in 1942 and an article containing the autobiographical account of Dr. G. G. Sedgewick entitled, A Secret Chapter in the History of Education, which recounts the trials of a new teacher in Oyster Pond in 1900. In addition, series contains a typed copy of Grace Forsythe’s memoirs of her teaching career together with a scrapbook of photographs of students from 1932-1957, illustrating her story, and two certificates recording her completion of grades nine and ten which also list subjects studied and grades received. 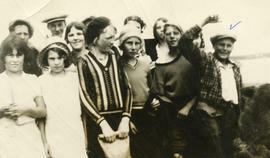 The local history series in this fonds contains student projects related to the history of Jeddore businesses.